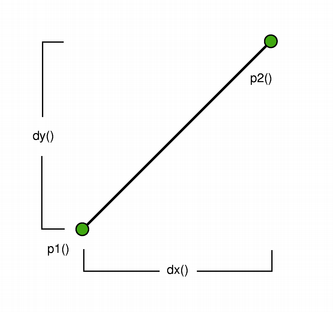 The intersect() function determines the IntersectType for this line and a given line, while the angleTo() function returns the angle between the lines. 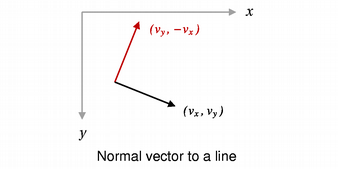 In addition, the unitVector() function returns a line that has the same starting point as this line, but with a length of only 1, while the normalVector() function returns a line that is perpendicular to this line with the same starting point and length. QLine is limited to the minimum and maximum values for the int type. Operations on a QLine that could potentially result in values outside this range will result in undefined behavior. The return value will be in the range of values from 0.0 up to but not including 360.0. 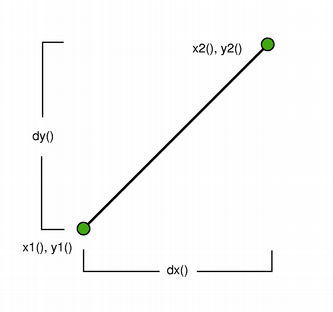 The angles are measured counter-clockwise from a point on the x-axis to the right of the origin (x > 0). Returns the center point of this line. This is equivalent to 0.5 * p1() + 0.5 * p2().